The MBSImP Virtual Learning Environment advances standardization of swallowing impairment assessment through cutting-edge eLearning technologies. The Medical University of South Carolina (MUSC), St. Joseph's Voice & Swallowing Center, and Johns Hopkins University joined efforts to develop the Modified Barium Swallow Impairment Profile (MBSImP). A research-based standardization of the Modified Barium Swallow Study (MBSS), the MBSImP assessment introduces consistency, specificity, and evidence-based practices to the evaluation of swallowing impairment. Before MBSImP could be recognized as a potential standard for assessment, the developers faced two challenges: how to introduce and train Speech-language Pathologists on the intricacies of the approach, and how to develop a community of Clinicians to advance research. DDA helped provide the answers with the development of the MBSImP Virtual Learning Environment (VLE). The objective laid before DDA's team of eLearning developers was a great one. Not only was the platform to serve as an environment in which registered Clinicians can learn, but also as an environment in which Clinicians can apply acquired knowledge to train and confirm adequate comprehension levels through testing. To convey the components of the MBSImP assessment process, the platform features a hybrid of fluoroscopy videos, paired with detailed 3D animations created from scratch by DDA. Beyond training, registered MBSImP Clinicians have access to a Patient Data & Reporting interface to track patient progress and outcomes, and demonstrate evidence for treatment. For MBSImP, DDA created an eLearning platform comprised of three zones: Learning, Training, and Reliability. 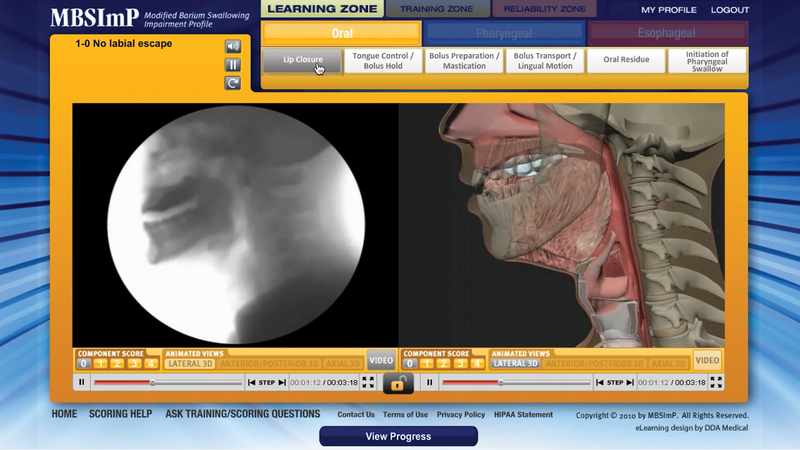 Within the Learning Zone, registered MBSImP users have access to 17 modules containing a fluoroscopy video of a swallowing impairment, paired with a detailed 3D animation. Using DDA's innovative Sync-lock Technology™, the video and animation can be synchronized and watched in incremental steps. Users can then adjust degrees of impairment to witness a side-by-side comparison of variances in swallowing dysfunction. Accompanying voiceover narrations provide information on the swallowing component and define the scoring methodology. In total, DDA's team of 3D animators developed 72 highly detailed and precise animations in-house. For the Training Zone, DDA integrated two practice areas. The first displays 20 swallowing studies. Here, registered users score the components of the swallow, while observing a video fluoroscopy. In the second practice area, users are asked to score 15 full-length swallowing studies. Users are presented with the patient's history and unique study variables and asked to score all 17 components. After the first two zones of MBSImP are complete, the user gains access to the Reliability Zone. Here, they will demonstrate their proficiency by scoring 10 full studies with at least 80% accuracy. After completion of the Reliability Zone, users gain access to the Patient Data & Reports interface where they can contribute to the first and only international data registry dedicated solely to swallowing dysfunction. The intricate database programming coded by DDA's staff includes well over one thousand information fields, with patient profiles alone including 716 data fields each. In development of the MBSImP Virtual Learning Environment (VLE), DDA provided comprehensive flash programming, design, animation, and database programming services. The technology backing the platform is complex and innovative, resulting in a streamlined, engaging, and informative user experience. Stored on DDA's non-internet facing, ultra secure servers, the MBSImP database complies with HIPAA's high standard of security. Launched in the spring of 2011, the MBSImP base of registered users is large and growing. The clear definition of the MBSImP approach made possible by the features of the Virtual Learning Environment (VLE) has made it possible for Clinicians to, "speak the same language across the entire Dysphagia care continuum." The MBSImP platform is a true testament to DDA's capabilities as a full-service provider of interactive technologies.